Internationally renowned composer Philip Glass and master kora player Foday Musa Suso's dramatic and style-shifting NYC concert. Internationally renowned composer Philip Glass and master kora player Foday Musa Suso have been performing and collaborating for the better part of the last three decades. 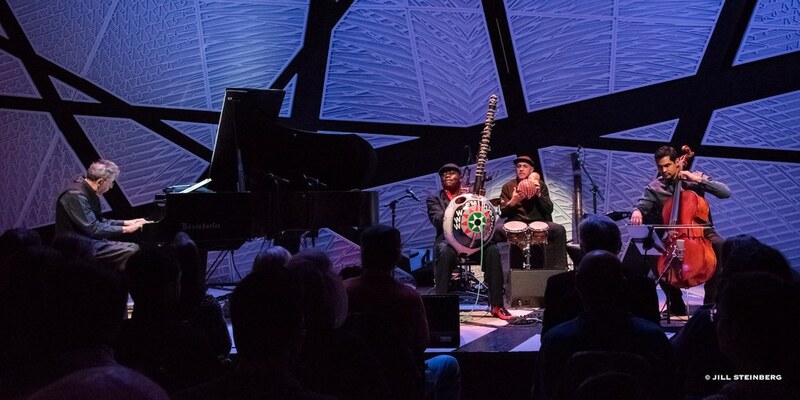 Their most recent appearance, which was hosted at Brooklyn’s newly opened performance arts space National Sawdust and co-produced by the World Music Institute, included percussionist Asher Delerme and cellist Jeffrey Zeigler for a four-piece ensemble. Their 90-minute set included selections from Glass and Suso’s famous collaborative album, The Screens. Originally commissioned as accompaniment for a play by Jean Genet about Algeria’s independence from France, this unconventional pairing was inspired by the playwright’s desire to contain both African and European traditions. As with each revisitation of the duo’s 1992 LP, Glass and Suso updated the original composition of tracks like “The Mad Caidi’s Court,” “Night On The Balcony” and “The Orchard,” accommodating for their lack of players with a tightly arranged rework. A similar approach was taken from songs performed from their score work on Godfrey Reggio’s 1988 art house documentary, Powaqqatsi. The evening reached its peak during the ensemble’s performance of Philip Glass’ Orion, a remarkable album featuring an international cast of collaborators (including Ravi Shankar, Wu Man, Ashley MacIsaac and Suso). Between ensemble arrangements were a few captivating, wholly arresting solo sets. The first was from Jeffrey Zeigler performing Philip Glass’ solo cello composition, “Orbit.” Later in the set, Foday Musa Suso shared two original songs (“Kenyalon,” “Cloud Walk”) from his catalogue of solo material. These songs featured a dramatic shift in the style which Suso performed the kora, a massive, 21-string harp-like instrument invented by his ancestral grandfather almost four centuries ago. Tuned in a customary West African mode, these exciting solo kora songs were more intense and much less inhibited than formal arrangements by the full ensemble.